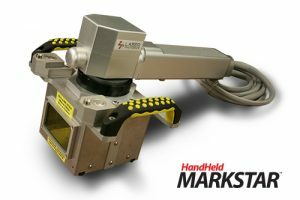 The MarkStar Series Handheld laser marking machine is the industry’s most complete held fiber laser marking and engraving system. The standard configuration of the handheld laser marking machine allows for many different options to meet any production need. This extremely versatile unit can be moved easily for convenient operation from any location and is capable of marking considerably large equipment and materials that would not fit into traditional marking systems. Additional features include ease of installation allowing for quick start-up and graphical-based programming for a minimal learning curve. Requirements beyond those listed above will be quoted upon request. Due to the increasing worldwide nature and importance of the optics/electro-optics industry, detector/sensors industry, components industry, and materials industry, the United States government and the Department of Homeland Security initiated a variety of programs where lasers became an essential part of the present and future defense applications. In the private sector, a variety of government contractors elected to use lasers and advanced optics to comply with strict government regulations. Laser Photonics envisioned the opportunity and successfully introduced and delivered applications compatible with military standards while continuing to perfect the use of our laser technology for future commercial and defense applications. The new Hand-Held Fiber Laser Marking Machine produces Permanent, Legible, Non-Removable Marks on a Variety of Materials.